There are certain claims where small claims court may be the appropriate venue, as opposed to superior court. Typically, this includes claims against owners for unpaid assessments, fees and/or fines that do not exceed $5000, which is the limit that a California community association can recover in small claims court. When it comes to assessment collection, we generally only recommend small claims court where the association has already exhausted its other remedies, such as non-judicial foreclosure, and is trying to collect from a former owner who has lost their unit or lot to a senior lienholder/the bank. Starting a small claims court case is relatively easy. Many courts have small claims forms online which can be completed online or downloaded from the internet. However, knowing what to allege in the complaint form and how to present the case is not always that easy. A small claims complaint (form SC-100 for Los Angeles Small Claims Court) requires the association to provide the name(s) and address of the delinquent owner(s) and to briefly describe the nature of the dispute (which includes (1) why the owner owes the association money, (2) when the obligation to pay became due, and (3) how the amount was calculated). Once the association files the case and pays the filing fee, the court will set a hearing date. The association then needs to have a process server serve the owner with the complaint and notice of hearing at least 15 days before the hearing. The proof of service (form SC-104 for Los Angeles Small Claims Court) must be filed with the court five days in advance of the hearing. If a judgment is entered in favor of the association, the association may recover the filing fee and service fee. SwedelsonGottlieb offers the preparation, filing and service of the small claims lawsuit and the preparation of an outline to be used at the trial, along with the organization of the exhibits. When appearing in small claims court, the association’s representative may be in a position to settle the claim. That person should be given settlement authority and encouraged to discuss settlement with the defendant. In fact, the court may have a mediator available to assist with settlement. If a settlement is reached, be sure to have the court hear and document the terms. If payments are involved, the court may be willing to continue the trial to see if the defendant pays per the agreement. At the trial and when appearing before the Judge or hearing officer, it is important to be prepared with the evidence/trial exhibits and be as clear and concise as possible. The Judge hearing the case will likely have 20 to 30 cases scheduled that day and a limited time within which to hear them. The Judge will appreciate a party that gets to the point quickly and does not bring in information that is not relevant to the case. Keep in mind that the Judge knows nothing about your case, and you will not have much time to present the association’s case. 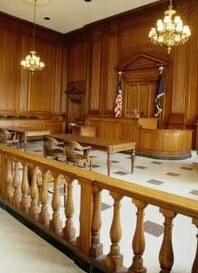 A few brief statements about who you are, who you represent, what the case is about and why judgment should be entered in favor of the association will give the Judge or hearing officer a thumbnail sketch about what kind of evidence he or she is about to hear and why that evidence is important. It should be noted that only management or a member of the board of directors has the authority to present the case to the Judge (a homeowner who is not a member of the board of directors does not have such authority). California Code of Civil Procedure section 116.540 authorizes an “agent, management company representative, or bookkeeper” for a community association to appear in small claims court. The person who will be appearing on behalf of the association will need to fill out form SC-109, which is an Authorization to Appear form and signed declaration under penalty of perjury. Managers should take a copy of the statute to court so that the court will understand that a manager can appear on an association’s behalf. 5. Any other documents related to the association’s prior efforts to collect the delinquent assessments, such as attorney or collection service demand/pre-lien letters, the lien and other collection related documents. Presenting the association’s case in chronological order will make the most sense to the Judge. Start with a brief description of the association; tell the Judge where the association is located, how many units or lots are contained within the development, the amount of the monthly assessment or any special assessment and why it was levied, and that the association is governed by a set of CC&Rs which authorize it to charge assessments for the maintenance, repair, and reserves of the association. Explain to the Judge that under the association’s collection policy (and the Davis-Stirling Common Interest Development Act), an assessment is delinquent if not paid within 15 days of its due date. You will need to explain that the association is entitled to recover late fees and interest on the delinquent assessments at 12% per Civil Code Section 1366(e)(3). Be sure to mention to the Judge that when one owner does not pay his or her assessments, the other paying owners are then compelled to make up the deficit added to the maintenance, repair, and reserve obligations. Next, tell the Judge that the association maintains a statement of account for each member. Give the Judge the details on how the account is maintained. For instance, tell the Judge that the payments are received, often directly by the association’s bank, and then imputed into a report that the association uses to keep the statement up to date. Basically, the Judge needs to be able to rely on what the account statement shows as a delinquency. Tell the Judge exactly what is owed, the late fees, and the interest and ask the Judge for judgment in that amount. Explain, if appropriate, that the defendant is no longer an owner having lost their home to their lender through foreclosure. After you conclude, the (former) owner will be able to present a defense. Often, the owner will not appear because he or she will have no defense. Owners that have refused to pay because they are unhappy with management or the board likely will appear and argue that they have not paid because they have not received the services for which they are paying. California cases have held that such an argument is not a good reason to withhold assessment payments. Owners do not have the right to offset their payments because they believe that their association owes them money or is not providing services. At the conclusion of the hearing, the Judge may take the matter under submission and rule later or, alternatively, enter a judgment right then and there. If the judgment is in the association’s favor, it can be enforced just like any other money judgment. Under the law, the judgment is stayed for 30 days, which means it cannot be enforced during that time. The owner has a right during that period to appeal and have a new trial. After 30 days, if there has not been a request for an appeal, the judgment can be recorded (by way of a document that the association will prepare and the court will issue, called an Abstract of Judgment) to create a lien on any property that the owner owns in the county in which the abstract is recorded. The association can also undertake an execution sale to foreclose on its judgment lien. The judgment can also be used to levy the owner’s bank accounts or garnish his or her wages. If the Judge rules against the association, there is no opportunity to appeal. However, that does not mean that future assessments are not owed, it only means that the association has not persuaded this Judge in this circumstance. If the judgment is in the association’s favor, the owner may appeal to the Superior Court and request a new trial. In such a case, the association can retain legal counsel to represent it in the trial proceeding. Small claims court has its advantages. It is fast and not that expensive. But it is also the “people’s court”, and some small claims court Judges or hearing officers are predisposed to side with the owner. In many cases, especially when trying to collect against a former owner, the disadvantages are often outweighed by the speed and low cost of this court. Follow this link for a printable version of this post. David C. Swedelson is a senior partner at the law firm of SwedelsonGottlieb. He can be contacted at dcs@sghoalaw.com.